For any new players to Where on (Google) Earth, simply post a comment with latitude and longitude (or a description of the location) write something about the geology. If you win, you get to host the next one. Posting time is 21:20 CEST (19:20 UTC). Vindication (left) and Candlemas (right) islands, 57.10S 26.76W, South Sandwich islands. A very interesting place, as the Google map image is the low-res image, whereas Google Earth has just one high res image on top of it. I must admit I cheated a little bit -- but showing an active volcano so obviously at high latitudes was calling for it. Anyway : http://www.geocodezip.com/v2_activeVolcanos.asp , then selct by regions to see the active volca at high latitude. I first tried the Aleoutians before moving to Antarctica. It appears that the smoke is probably just geyser activity. Hmm, I'm having problems with this comment. Let's try again. That's Candlemas & Vindication Islands, in the S. Sandwich. Both are volcanoes, Candlemas had an historical activity in ca. 1910. Apparently the clouds we see are geysers, not a "proper" eruption. 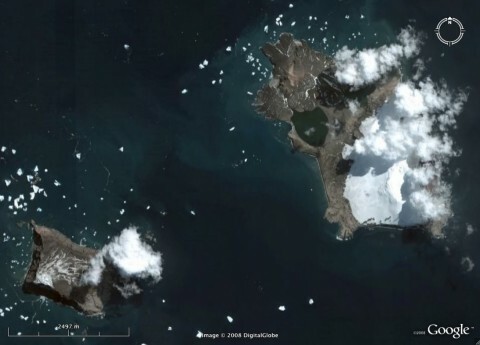 Amusingly, these two island are a high resolution zone in Google Earth in the midst of a mostly low-res region; in Google maps, Candlemas is low resolution too. Actually this specific volcano was not active and therefore is not in the database, but Michael, to the immediate South, is in the base.